If you are apprehensive about the complexities involved in managing your website then we have some good news for you. Our Visual Composer implementation service will take the pain out of your website management processes. 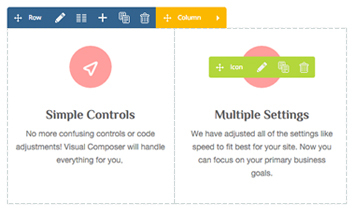 Visual Composer is one of the most robust plugins designed for WordPress and this plugin simplifies website management through its drag and drop interface. 1You do not need any technical knowledge to build your WordPress websites any longer. 2Create responsive websites in a jiffy without any need to technical skills. 3Allows you to build frontend as well as backend pages. 5Comes with lifetime free updates. 6Customization capabilities of your WordPress theme are enhanced greatly with this plugin. 7Compatible with all WordPress theme. 8Everything could be accomplished through simple drag and drop. 9More than 40 predefined templates. We have been one of the most experienced WordPress experts and we have vast experience in visual composer implementation. We make the entire process of implementing the plugin absolutely hassle free. You need not have any technical knowledge, either designing knowledge or programming knowledge. We take care of everything. We give top priority to customer satisfaction. You can be 100% sure of the quality of the service rendered. After the implementation of the plugin, you will be able to manage your entire website easily. You can create new pages, redesign them and make modifications to them on the fly without any need to hire a designer or programmer. Build complex, content rich pages in minutes instead of weeks. No programming knowledge required! Forget about fighting with [shortcodes]. All new, powerful grid builder for easy display of posts and portfolio elements. It accommodates custom posts too. Easily access and modify frontend as well as backend editors anytime you like to suit your personal preferences. Advanced skin builder with custom CSS option, which puts complete control over the website look and feel into your hands. Seamless design implementation without having to switch between user types. Access more than 40 readymade styles for your grid and content elements. You will have amazing control over grid building. "I really couldn't be happier with the results, we have done a bunch of projects together and both clients and me are 100% happy. Many thanks guys and looking forward for th next project! Keep up the good work !"